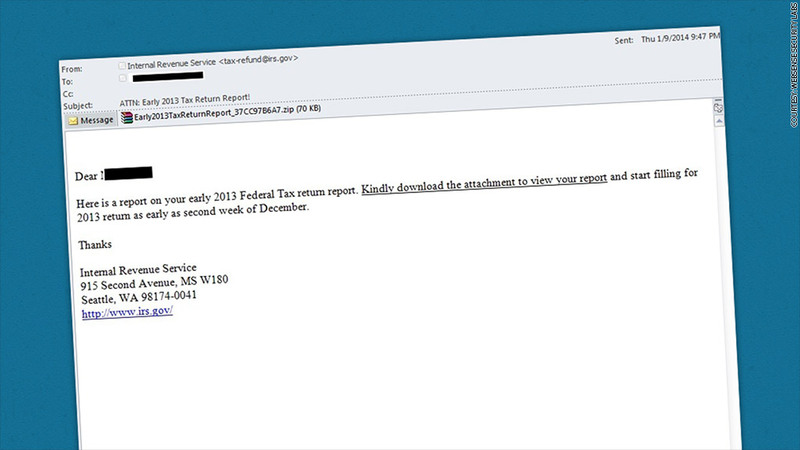 Small businesses beware: The IRS never sends emails with tax documents. Cybercrooks send bogus emails like these to access important data. As if tax season isn't stressful enough, cybercriminals are also out in full force, looking to unleash attacks against unsuspecting small businesses. "Not only do criminals exploit its anxiety and fear factor, but the tax season also gives them the opportunity to generate a variety of social engineering tricks," Haley said. Small businesses are targeted more than large firms because they're more vulnerable and the schemes are more lucrative. "Large companies are better protected," said Haley. "Cybercriminals know that smaller firms are more lax with their security and probably keep more money in their bank accounts." "We're seeing about 100,000 IRS-themed email scams circulating every two weeks in the U.S.," said Watson. "They started in late December and it's going strong now." "In most cases, the attachment looks like a spreadsheet or a document file," he said. If you open it, it launches malware on to your computer or phone. Once it's installed, the malware allows scammers to steal login information and bank account credentials. In its annual list of "Dirty Dozen" tax scams, the IRS highlighted this particular attack, which is carried out through a fraudulent email or website. "This is a particularly vicious attack," he said. "It will not only lock your personal files but also encrypt them and hold them for ransom." Good security software is a must, said Haley, as is password protection. Just don't use the same password everywhere! Also, be very careful about clicking on links in an email. Finally: "Be suspicious," Haley said. "Scammers are quite good at making emails and links look legitimate. Know that the email 'from' the IRS will never be from the IRS."